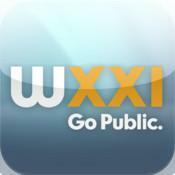 The WXXI Public Media App allows you to watch and listen to all of WXXI programs, Radio and TV! The app provides On-Demand content of all your favorite shows, live streaming of the radio channels, PBS Kids! content, easy access to the live Radio and TV program schedules plus the ability to explore additional content! • DVR-like controls (pause, rewind, and fast forward). You can pause the live stream to have a conversation and pick up right where you left off. Or rewind to catch a comment you just missed. • Listen to live streams from WXXI even while traveling. • Integrated program schedules for WXXI Radio and TV content. • Listen to WXXI in the background while browsing the web or catching up on your emails. • Access WXXI programs easily and quickly. • When listening to programs, individual segments (when available) are listed so you can review and choose one, or listen/watch the entire program. • The WXXI Public Media App displays the web page associated with the program or program segment you are listening to On Demand so you can explore for more information.